A 1963 Epic Movie about the Siege of the International Legations during the Boxer Rebellion in the waning days of Imperial China. The movie primarily focuses on three fictional characters — U.S. major Matt Lewis (Charlton Heston), British minister Sir Arthur Robertson (David Niven), and Russian baroness Natalie Ivanoff (Ava Gardner) — as they struggle to hold out against the Boxers and have various personal issues. The movie was a Troubled Production and an almost literal Creator Killer. Director Nicholas Ray (he who gave us Rebel Without a Cause) collapsed on the set and had to be replaced, first by Andrew Marton (co-director of The Longest Day) and later Guy Green. Ray's career never recovered. Charlton Heston hated Ava Gardner, later describing her as The Prima Donna who showed up on-set drunk, constantly demanded rewrites and argued with Ray and the other directors. Heston worked with her again in Earthquake anyway. The script was constantly being rewritten during filming, with some of the stars bringing in their own screenwriters to rework their scenes. To top it all off, the film was a Box Office Bomb, which was very bad because, as you'll know if you've seen the totally epic action sequences, this movie was freakin' expensive. Besides ruining Ray's career, it also sunk Samuel Bronston's production company, which had previously made the successful El Cid and King of Kings. Perhaps this was karma for the film's deplorable use of Yellowface for nearly every Chinese character with lines. Nevertheless, the film has found a life on cable. And yes, Peking is Beijing. 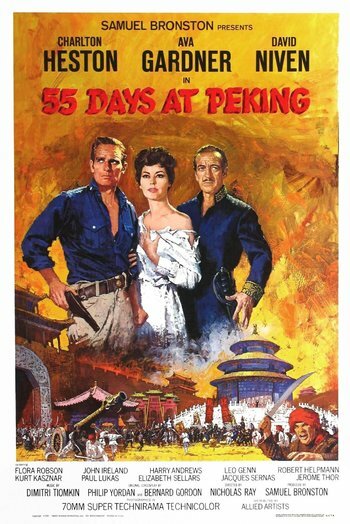 See Why Mao Changed His Name to find out why this movie wasn't called "55 Days at Beijing". All Asians Wear Conical Straw Hats: Not all of them, but we see a good number wearing them. Aluminium Christmas Trees: Modern Spanish viewers often see the presence of a Spanish ambassador and legation in the film as the movie makers pandering to Francisco Franco for logistical support. While there was some of that, it is true, however, that there was a Spanish legation among the besieged, and that Spain was one of the signatories of the peace treaty with China as a result,note In fact, the treaty itself was written by Spanish ambassador Bernardo Cólogan, because he was the eldest among the foreign ambassadors even though Spain wasn't in a position to send troops to China right after losing Cuba and the Philippines in the Spanish-American War. Anyone Can Die: When the siege begins, civilians start dropping alongside the soldiers. The Cavalry: The Eight-Nation Alliance forces at the end. The looting and destruction which followed is tactfully unmentioned. Deadly Decadent Court: The Chinese court. Though Empress Cixi's depicted with some measure of sympathy, her courtiers openly scheme against each other and the Empress herself orders an adviser's execution for "disturbing the tranquility of the day." End of an Age: The end of Imperial China, of course. While the actual Xinhai Revolution comes eleven years later, the ending scenes heavily foreshadow the fact that the end of imperial rule is nigh. It's also near the end for Tsarist Russia, but this doesn't come up in any scenes with the Russian characters. Enemy Mine: All the nationalities work together to hold out against the Boxers, so that they can blow each other to hell fourteen years later. Gorgeous Period Dress: Especially at a ball near the beginning of the film. There's also the Imperial Chinese court. Grande Dame: Empress Dowager Cixi. Also an Iron Lady and, technically speaking, the film's Big Bad (she's a bit of an Anti-Villain). Historical Hero Upgrade: The Eight-Nation Alliance, natch. The movie tries oh so hard to pretend putting down the Boxer Rebellion wasn't really about imperialism. Instead, it was about honor or... maintaining peace or... something. Whatever, it sounds credible when you say it in a Rousing Speech with David Niven's accent. Also, the relationship between the various powers wasn't nearly as harmonious as depicted in the film. The film also omits the widespread destruction, looting and murder carried out by the Eight-Nations after the siege was lifted. Historical Villain Upgrade: Technically averted, as the Boxers really did carry out the sort of attacks on civilians shown in the film. However, the whitewashing given to the other side makes the Boxers look worse in comparison, as it implies a greater difference in the morality of the two sides than really existed. The film does at least show that the Chinese people have very justified reasons for being angry at the occupation of the foreign powers. National Anthem: At the beginning, the camera pans around the foreign compound to establish all the countries present by showing them raising their flags, each with a band playing the accompanying anthem. Notably, the raising of the American flag is set to "To the Colors", accurately reflecting the fact that "The Star-Spangled Banner" had not yet been adopted as the national anthem. We also hear the old "God Save the Tsar!" anthem as the Russian tricolor is raised. The movie inaccurately plays "Deutschland Uber Alles" for the German flag, but this might be an Acceptable Break from Reality considering the actual German anthem of the time had the same melody as "God Save the Queen". A similar scene occurs at the end, showing how the atmosphere of international unity has disappeared without the Boxers providing a common enemy. Not Even Bothering with the Accent: Ava Gardner doesn't even really try for a Russian accent. Quintessential British Gentleman: What could be more British than David Niven playing a Victorian gentleman? Rogue Juror: Sir Arthur votes to stay while all the other ministers vote to leave. Realizing they'll look ridiculous if the British stay while they leave, the others all change their votes. The Russian minister comments, "I shall report in my diary that the first vote was nine to one, and that, uh, in a friendly spirit it was then decided to make the decision unanimous." Sensual Slavs: Baroness Natalie Ivanoff. Despite being both Russian and an in-universe baroness, she is not an example of The Baroness. The Siege: The whole movie is about the fifty-five days during which the Legation Quarter residents held out against the Boxer rebels. Siege Engines: Near the end of the film, the Chinese invent one which launches rockets. Translation Convention: Near the beginning of the film, Major Lewis teaches his Marines to say a few words in Chinese. This appears to have been a waste of time since all the Chinese characters speak English anyway, even when no Brits or Yanks are present. It's a similar case with the Russians, Germans, Japanese, Italians, French, and Austrians. Unflinching Walk: Sir Arthur and Major Lewis walk through a crowd of hundreds of hostile Chinese without losing their cool. Very Loosely Based on a True Story: The movie loosely follows the real history of the Siege of the International Legations. Heston's character is loosely based on John Twiggs Myers and Niven's on Claude Maxwell MacDonald . Perhaps the most notable deviation from the real story is the portrayal of the western powers (plus Japan) actively choosing to stay at the International Legations in order to make some kind of principled stand. In real life, they were more than willing to get the hell out of there, but couldn't because the countryside was swarming with Boxers. Yellowface: So, yeah... there's this. While there are lots of extras played by Chinese people firmly in the background of scenes, out of the four major Chinese characters only Teresa is played by an actor with anything close to the correct nationality (Lynne Sue Moon was Anglo-Chinese). By contrast, Colonel Shiba was played by Juzo Itami. Your Terrorists Are Our Freedom Fighters: Needless to say, the western characters view the Boxers as terrorists ("bandits", in the language of the film). However, it's made clear that the Boxers view themselves as fighting to free their country from foreign occupation.